Is a question often asked at the beginning, so that is more than likely the best place to make a start. Pond filters are employed to remove ammonia from the pond water and not specifically to keep it clear. You can have an efficient filter that does not give you clear water in your Koi pond, although it must be said that the two do normally go hand-in-hand. Koi excrete ammonia directly from their gills as the disposal of part of their nitrogenous waste. 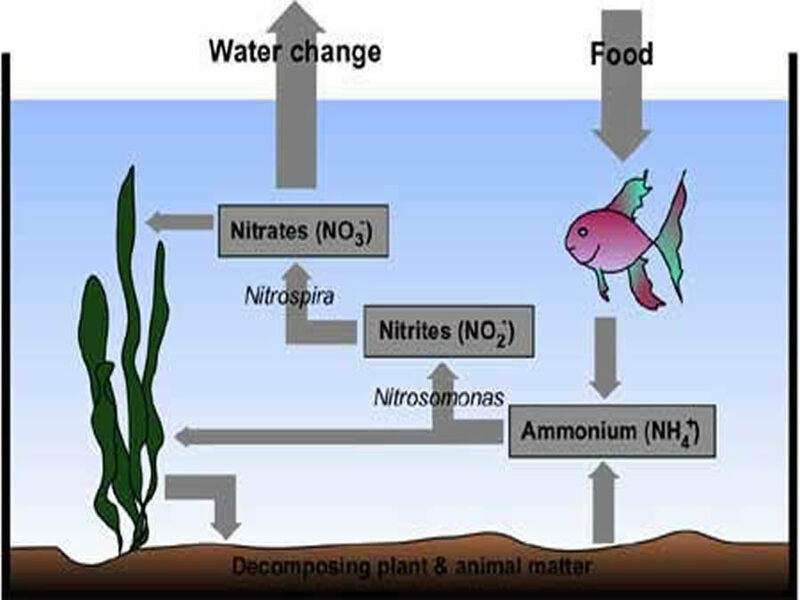 Ammonia also comes from the breakdown of plant waste, of solid and liquid waste from the Koi, and the breakdown of all manners of other organic debris in the pond. 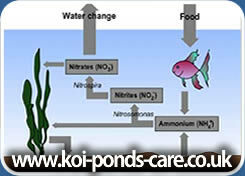 In the enclosed pond environment, ammonia will accumulate and build up to toxic levels for the Koi. To prevent damage to, or at worst the death of Koi, this ammonia must be removed from the water. This is carried out biologically through the provision of a suitable pond filter. DIY pond filter systems Having accepted the basic idea of a filter, the next question usually is "how big should it be?" and this depends on whether you intend to build your own filter system, or opt for a commercial unit. For the building of a DIY filter, there are fortunately "rules of thumb" that have been established for some time to guide us through. If we consider that a suitable Koi pond should be between 4 and 6 feet in depth, we can see that an "average" depth can be taken as 5 feet. To then create a pond of a size that will provide an acceptable amenity in the garden, we need something not smaller than about six feet by twelve feet in size. This will give us a pond of 360 cubic feet in volume, and the water capacity can be worked out from this by multiplying the volume in cubic feet by a factor of 6.25. Therefore, in the case of our hypothetical pond this will indicate a capacity of 2250 gallons (multiplied by 4.55 to give 10237 litres)- ideal for a smaller Koi pond. We can then apply our "rule of thumb" for filter size, and say that for a pond of this depth, using an "average" media such as gravel, that the filter plan surface area should be between 1/3 and 1/2 of the pond plan surface area. This will indicate a size of between 24 square feet (4' by 6'), and 36 square feet (6' by 6'). It should contain submerged medium, we did mention gravel, in a layer about 9" - 12" thick. If you wish to utilise a more modern, and perhaps more efficient medium, then there are a number of lightweight plastic mouldings available that can be bagged in nylon mesh bags for easy removal and cleaning. These are sold under various trade names such as "Flocor", or "Bacballs" etc. A more 'solid' medium that has a very large area is known as "Alfa Grog" and this finds favour with many. It is far more efficient than the equivalent amount of gravel and therefore you should be able to use less. Take your dealer's advice. There should be provision made during the filter's design for flushing away solid waste matter to prevent its accumulation. If waste matter is allowed to accumulate, it can provide a haven for pathogens (disease causing organisms) that will strike when you least expect them. It can cause eventual filter blockage. Commercial Koi pond filters There are many systems on the market that have been designed specifically to cater for the Koi pond. These may be classified by the number of gallons they will support. Always check with your Koi dealer, as a more accurate assessment can be made depending on the size and number of Koi in your pond. If you intend to stock more Koi than the recommendations for the filter of your choice, you may need to consider a bigger filter, or the doubling up of systems. When shopping, always take your pond details with you, and then your Koi dealer will be able to make sound recommendations. Flow rates and quantities of biological filter medium may vary from those recommended in the 'DIY' advice given above, but modern and efficient filter systems make better use of medium, and all other requirements are adjusted to suit. DIY Filtration The system's water must be circulated through the filter at a specified rate, and here again a "rule of thumb" applies. We can say that for a system of up to about 55,000 litres, the total amount of water must be turned over through the filter once every two hours. Over 55,000 litres capacity, this rate is not so important and can be slowed somewhat. Therefore, if your pond has a capacity of 9,100 litres, and you have 1,365 litres of water in your filter, then your system capacity will be 10,464 litres of water. The flow should therefore be in the region of 5232 litres per hour. However, if you have a lot of tortuous pipe runs, and a lot of accessories such as UV's and Venturis, then these will slow the rated flow of your pump considerably. This must then be taken into consideration. In a hypothetical pond of 11,375 litres, it can be that to maintain a true flow of 5118 litres per hour, we will need a pump of up to 6825 litres per hour to give us the desired flow. When purchasing a pump, then always describe the system, its pipe runs, and accessories to your dealer and then he will be able to advise accordingly. There must also be a certain "residence time" for the water in the filter medium. This should be about 20 minutes, and it can be seen that for a flow of 5686 litres per hour, to obtain the correct dwell time, the filter needs to contain about 1911 litres of water as well as the medium. The foregoing suggestions are for DIY filtration systems, and if you wish to opt for a ready-made system, there are a lot of these to choose from. Most such systems operate using slightly different criteria, and once again you should take your dealer's advice. Filtration success all boils down to learning as much about the technicalities of what you are doing as possible, paying attention to detail, acquiring knowledge, and applying it in the best way you can. Broadly speaking, it is still correct for a commercial system to have the same turnover rate as a DIY system, but mostly this will make a nonsense out of the recommended 'residence time' for water in the medium. The answer to this one is that because such a filter makes more efficient use of it's filter medium, it can achieve the same ends with less residence time. Gravity feeding Looking at a typical Koi pond filter system it is generally accepted that for the best efficiency the water must be gravity fed around the system to enable settlement, where solid matter is separated from the water, to take place. In a gravity fed system the filter is usually mounted with its water level at the same level as that of the pond. It will have large diameter inflows, and the pump/s will be situated at the end of the system where they take water from the filter, and return it to the pond. The water in the filter is replenished from the pond under gravitational force - hence the name of the filter. Pump feeding Sometimes it is not practical for one reason or another to gravity feed a filter system. Then it will be necessary to use a pump fed filter system. Here the pump is situated in the pond (submersible type) and it pumps water into the filter. It is very important here to have free flowing medium, and a water bypass system fitted. This is because pumps when situated in the pond tend to liquidise the solid debris thus making it very hard to separate it from the water using settlement. The resultant high debris load in the water can cause filter blockage and overflow - hence the by-pass. Settlement of solid matter from the water can be achieved in several ways. The most common are described here. a) Settlement Chamber This is a large chamber, where the solids are encouraged to settle out from the water under the force of gravity. This works on a similar principle to a settlement lagoon at a sewage farm. This should contain some brushes (one or two rows) to trap the lighter floating debris such as blanket weed that will otherwise find it's way through. The chamber should not be completely filled with brushes, or the natural settlement action is impeded. b) Vortex Chamber Here the solids are removed by dynamic action that is induced by having a spiral movement imparted to the water. The large solids are removed by the boundary layer of water that builds up adjacent to the cylinder walls, and the central vortex column removes the small solids. The most efficient vortexes are those that have no internal pipes to impede the smooth flow of water. Biological filter Once the solid matter has been separated from the water, the flow is directed to the biological stage of the filter, and the action that takes place here has been described earlier. The biological media can either be submerged, or can be configured as a trickle filter "tower" where the media is exposed to the air, above pond level, and the water is flowed through it via a spray-bar. There are some ponds that still employ under-gravel filters, which are built under water at the bottom of the pond. A (submersible) pump draws the water through them. These still have their application in situations where garden space is restricted, but are no longer highly regarded for a number of (mainly hygienic) reasons. Within the pumping stage is incorporated not only the pump, but also all of the auxiliary equipment that is fitted to the system such as UVS, magnets, Venturis, and sand filters etc. UVC (Ultra Violet clarifiers) Used to prevent green water by disrupting the algae at cellular level. It causes the cells to stick together or flocculate, when they will settle out and can be removed by hoovering, or are trapped in the settlement chamber where they can be flushed away. By creating a flux in the water, magnets prevent the formation of filamentous algae, or as we better know it blanket weed. These will disrupt the calcium carbonate molecules in pond water, making it unavailable to algae that forms blanket weed. These inject air into the return flows of water to the pond. These will remove the very fine particulate matter that can still left in the water, giving it a final "polish" before it is returned to the pond. These can be included in the pumping stage for assisting in the over wintering of Koi, or even for boosting top summer water temperatures which some of the top Koi keepers now do. Having read all of the foregoing, it can be seen that a filter is quite a complex part of the Koi pond system, and must be regarded as a living component, just as the Koi are. It should have equal care taken of it. Already mentioned are flushes, which must be operated on a regular basis to keep the system clear of sludge. No matter how good your settlement is, this always seems to build up to a certain extent. You must take care also that no part of the filter system is cleaned with tap water as this contains chlorine that will cause nitrifying bacteria to die back. If you do have any parts of the filter system that do need to be washed, such as sponges, then do this with pond water and don't get things too clean. Washing off the worst of the dirt is all that is necessary. Your pond filter must never be switched off, apart from the odd half hour for essential maintenance, otherwise the nitrifying bacteria, starved of oxygenated water will again die back giving you a less efficient filter when switched on again. Likewise UVCs (Ultra Violet clarifiers) must never be switched off, apart from when medication of any sort is in the pond, although this statement could be seen as controversial in some circles. If you switch off UVCs for more than a short period, then you will get a build up of slime on the surface of the quartz tube that will reduce its efficiency when switched on again. The unit will then have to be dismantled to clean it with all the associated dangers of breaking the quartz tube. UV filament lamps should also be changed once per season as the emission deteriorates after a while. Sometimes it is not practical for one reason or another to gravity feed a filter system. Then it will be necessary to use a pump fed filter system. Here the pump is situated in the pond (submersible type) and it pumps water into the filter. It is very important here to have free flowing medium, and a water bypass system fitted. This is because pumps when situated in the pond tend to liquidise the solid debris thus making it very hard to separate it from the water using settlement. The resultant high debris load in the water can cause filter blockage and overflow - hence the by-pass. Gravity feeding Filter medium is a subject that causes many an argument at club level, and there is so much material available to read that it is very much "Hobson's Choice" as to which line you decide to follow. Personally we would go for a larger sized medium, that would not tend to block. Several types were mentioned earlier and this should make your personal choice somewhat easier. A few brushes are seen as useful in settlement chambers, but we have also seen "Flocor" used here, or even crumpled up fruit cage netting. Be careful not to fill your settlement chamber with such medium. Leave enough open space for true gravity settlement to take place. What we would suggest before making your choice of filter medium, is to take a look at what other hobbyists in your area are using and emulate this. It is obvious that if a medium is widely used in one area that considerable success has been achieved with it. Japanese matting cartridges are widely used, and many people swear by them, but sometimes they do take a long time to go biological. The newer reticulated foam cartridges are more efficient. Water testing is perhaps the most important part of Koi keeping as this can tell you a lot about whether or not your pond filter is working at peak efficiency. a) You should monitor firstly ammonia, and the presence or not of this will confirm for you whether or not your filter is performing satisfactorily, or whether it's efficiency is falling due to causes that need urgent investigation. b) You should then monitor nitrite (don't confuse this with nitrate), as nitrite appears after the first stage in the oxidation of ammonia. You can have the situation where there is no ammonia, yet nitrite persists, and this should lead you once again to investigate the filter performance. c) The third parameter of importance is pH. This can tell you a lot of things about your pond, and there is a certain band, which is better, suited to Koi. PH 7.5 to pH 8.3 is absolutely ideal, but Koi can exist from pH 7.0 to pH 8.5 without harm as long as it is stable. Any reading outside this range should be investigated and rectified without delay, but we would not advise that you tried any alteration of pH by artificial means such as the widely sold "pH buffers". Not only would this require a lot of buffering agent, but it would not be a permanent correction, would need to be repeated often, and you could thereby be masking a filtration defect. This Koi keeping hobby is, as you can see, rather a complex one but with a little learning applied and a little common sense, we can hopefully surmount all of the difficulties that others fall into, who are not prepared to acquire this knowledge and to apply it.